They come in all shapes and sizes, full of padding and not so full. You can fall asleep on the best ones. Waiting has never been very conducive to staying alert. 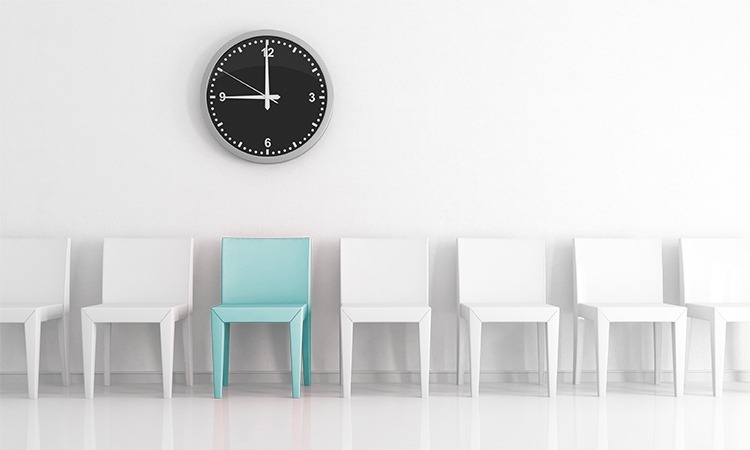 Having great chairs in the waiting room sends a message to you potential clients or patients. It tells them you care enough to provide them a little comfort as they wait for you. Bad waiting room chairs sends a message as well. It the signal that you do not care about the people who give up a part of their day to meet with you. 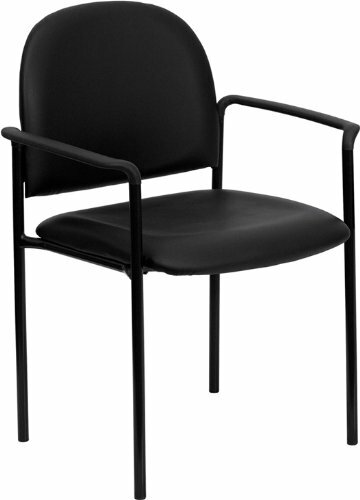 It is not too difficult to stock your waiting room with great office guest chairs. We have put together this list of 15 great selections for being the best waiting room chairs of 2019. Upgrading your waiting room just got easier. You can take some of the work out of your search for good replacements chairs by analyzing this list. This set of 5 office guest chairs will upgrade any waiting room at an inexpensive price. 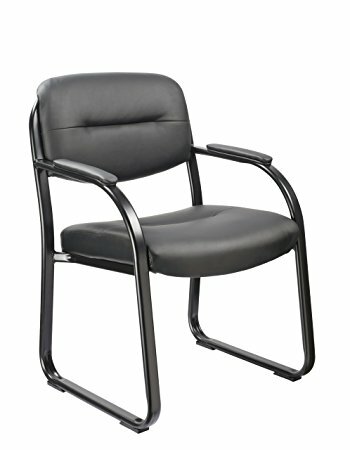 If you are worried about back support these chairs are ergonomic designed and made of sturdy metal. The feet of the legs are encased in plastic shoes to make sure they do not damage any floor. You do not have to worry about the size of your guests or patients as these chairs will hold up to330 pounds on their 19.3 x 22.4 x 31.5 inches frame. Also, there is no need to hire a mechanic to assemble these chairs. It may take just a matter of minutes in your spare time. Storing them will not be a problem. They can be stacked and put away in a closet until they are needed. Another entry in the stackable category, this chair is sold individually and blends in with any décor you have in your office or waiting room. The environment is not always ideal. Patients can work up a sweat waiting for their turn. The mesh fabric helps distribute the heat so that embarrassing scene does not take place. Even though their dimensions come in at 23 x 23 x 34 inches, weigh 17 pounds and are made of steel tubing, they can only hold up to 250 pounds. The lack of armrests enables them to be stacked four high for easy storage. The good news is that if you have any trouble with these chairs, they are backed by a lifetime warranty. 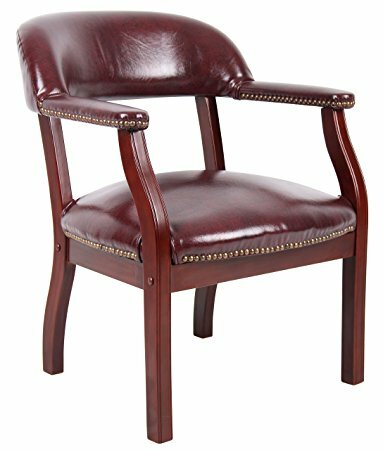 This guest chair is a throwback to the traditional style that has occupied waiting rooms for decades. 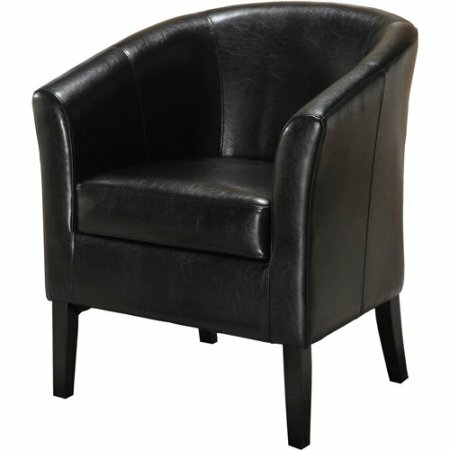 Its styling has been given a contemporary look with curved armrests, contoured seat, and black colored vinyl upholstery. One word of caution about the assembly. It may be advantageous to wait till all the bolts are started before tightening any. The weight capacity is said to be about 300 pounds but that Is not confirmed. 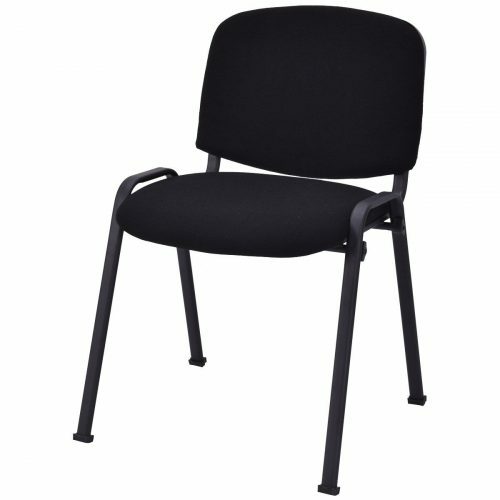 The chairs steel frame, cross braces and dimensions (23.8 x 23.5 x 33.2 inches) lend themselves to the durability and toughness of this product. The look of these chairs will give your reception area a modern look. Your patients will love the comfortable seats as they wait for their appointment. They will also like the fact the armrests are approx. 25” from the floor. If you want elegance and style in your waiting room but do not want to overdo it. Then you may consider this version of the office guest chair. Your patients get a touch of class and comfort all at the same time. 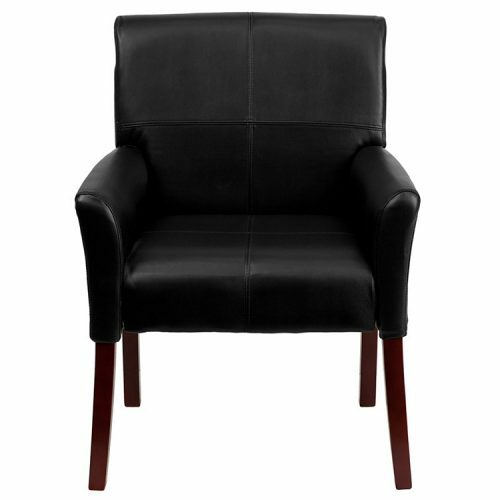 Built on a steel frame for toughness, this chair sports bonded leather upholstery, padded armrests and a very attractive look. Unfortunately, it will only hold up to 250 pounds on its 27.4 by 23.6 by 35.8 inches frame. This chair is not for everyone who walks into your office. On the brighter side this chair will give your waiting room that professional look. Your potential clients will be impressed by how your waiting room chairs spruce up the room. The color choice is easy. 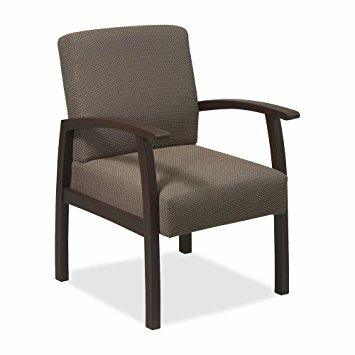 This waiting room chair only comes in black. When you want to make an impression you do not want your big clients waiting in not so great chairs. Make a big first impression with the modern styling and professional look waiting room chairs bring. Your potential clients will equally be impressed by the sturdiness, the durability these chairs possess. 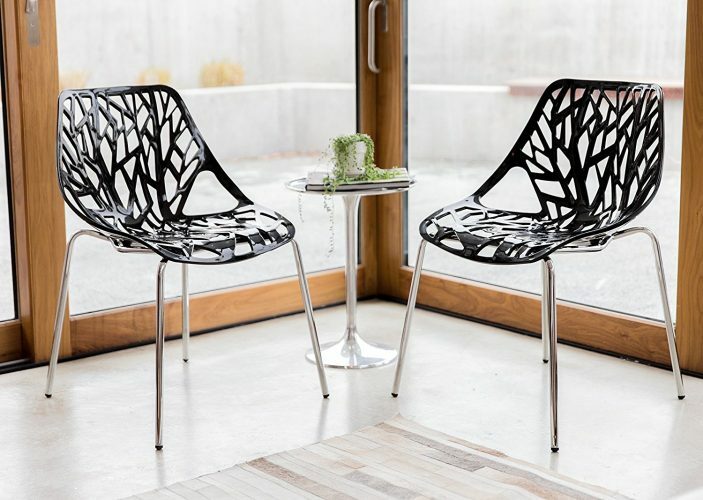 Clad in soft thread leather, over a steel tube frame these chairs do not damage the walls. Their special wall protecting designs ensures that you will not need to do costly repairs to your walls. The manufacture gave them generous padding to make sure your guests are comfortable. 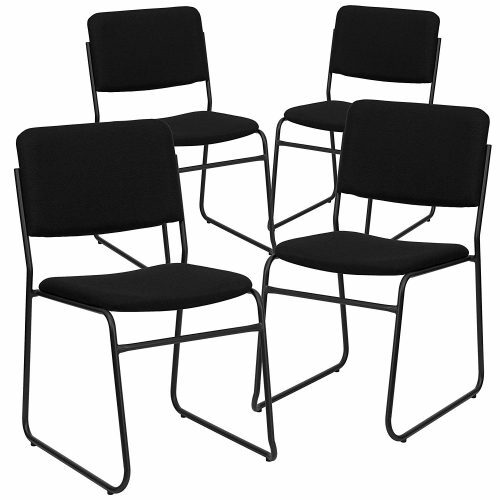 Rated to hold up to 250 pounds on their 25.8 x 25 x 32.8 frame these chairs are ready to meet your large clients. 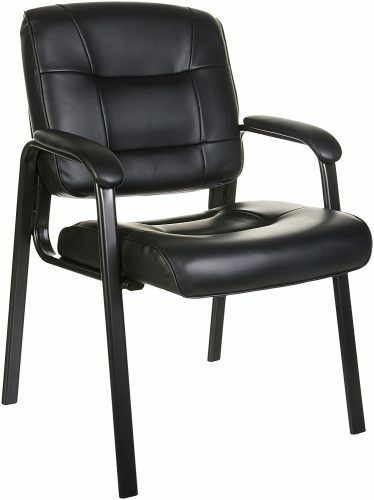 If your patients or clients are in the big and tall category, then your office needs these chairs. Rated to a 550-pound capacity, these chairs can hold the largest of your clients. The extra capacity maybe because of the thickness of the plywood in the seat. The contoured padded seats and vinyl upholstery combine to give these chairs a very contemporary style. 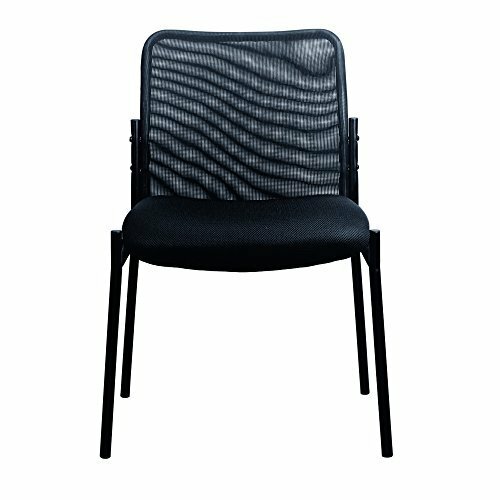 These office guest chairs have a variety of uses and can do double duty at your church, training room or wherever you may need them. Built on a solid 21 x 21 x 31-inch frame these chairs can take heavy duty use. 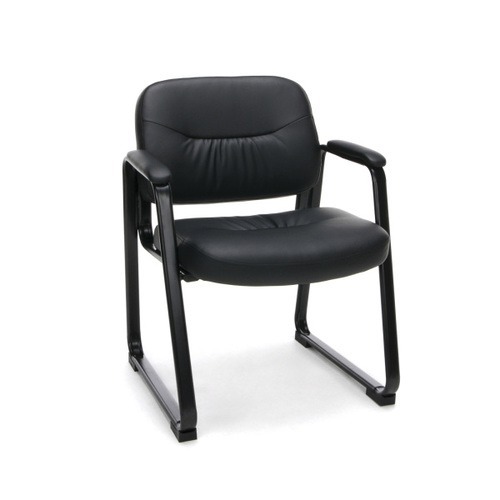 Equipped with bumper guards these office guest chairs will not damage the room they are placed. If you do not need them for a while then they stack twelve high for easy storage. Have you heard of casual Fridays? That is where office employees come to work in relaxed clothing. Well, you can have casual Fridays every day in your reception area with these casual waiting room chairs. Your office will almost have the fashion world’s couture look with these great looking chairs. Made of stainless steel with a chrome finish, these office guest chairs will open the eyes of all who come into your office. These are basic chairs, no padding, no upholstery, not fancy gimmicks. Rated to hold 330 pounds their dimensions, 25.4 x 25.4 x 22 inches, allow them to fit in any corner of any room. The maximum seat height is 18.5 inches. The most attractive feature is the current 2 year no questions asked warranty on all parts issued by the manufacturer. 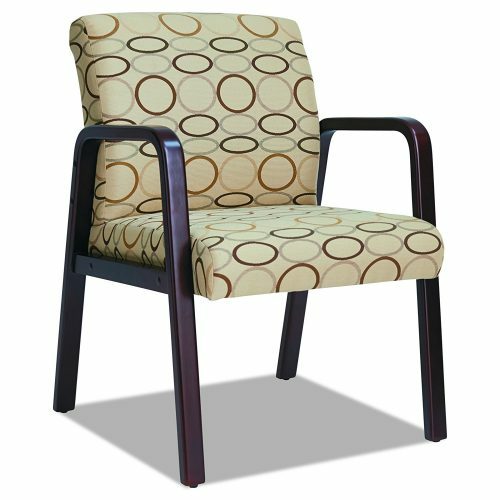 Give your office waiting room that traditional look with these waiting room chairs. Designed after the old 1950s professional style, these chairs will send the signal that you mean business. Your guests will rest comfortably as the seat is 18 inches off the floor. The other dimensions come in at 26 x 28.4 x 32.7 inches and have slightly flare armrests. Unfortunately, there is no rating for weight capacity. The arching backrest covered in black vinyl and placed on a hardwood frame says solid. It also says there is nothing weak about your business. You are a solid person just like your waiting room chairs. All the hardware needed for assembly is included which only takes fifteen minutes and a little common sense. Give your clients and patients the feeling they are sailing on a ship. These solid, mahogany finished hardwood frames set the tone in any office. One glance at these waiting room chairs and visitors will think they took a wrong turn somewhere. These chairs come with casters for easy moving and no need to pick up and carry to another room. The chair measures 24 inches wide by 26 inches deep by 31 inches high and can hold up to 250 pounds. There is a spring seat which keeps the chair from sagging when occupied. Set the distinguished tone in your waiting room as these office guest chairs hint at your impeccable standards. The brass nailhead trim lends to the distinguished look that will overwhelm your clients and patients. If you can’t afford a distinguished or classy look these practical waiting room chairs offer a good alternative. These chairs still say professional with their easy to clean fabric, padded arms and plastic feet on their legs. 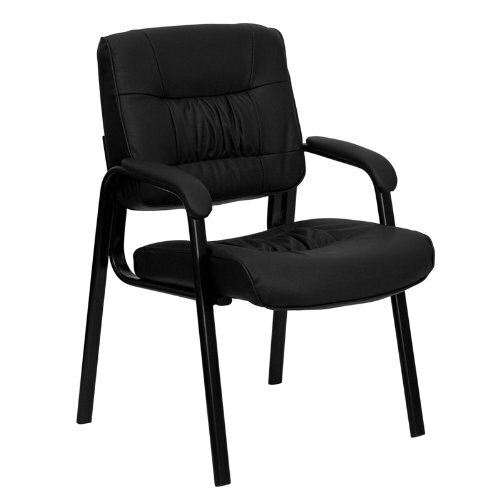 Made from steel tubing they are coated with a black powdered coating these office guest chairs still say comfort. Their 23-inch width by 25-inch depth by 35-inch height allows just about anyone to sit in them with ease. The thick padding and waterfall cushion provides ergonomic support for the back and hips. The seat lies 15-18 inches from the floor. It all depends on where you measure. Once you try these chairs out you may want to go back and get more. They are not only practical but very comfortable, sturdy and well built. Looking professional is important but there is a danger of looking too successful. One does not want to brag to prospective clients or patients. The wrong office chairs can send the wrong message. These chairs are just the right touch. They say professionalism but not snobby. Made with real wood legs, with a mahogany finish, these chairs are covered in real leather and have plastic feet to protect your floors. The seat is an ample 19 ¾ inches high giving your legs the height they need for comfortable sitting. It is also rated to hold 250 pounds. The other dimensions are as follows: 26.5 x 23 x 35.2 inches. These sturdy, comfortable chairs will give any waiting room the professional touch it needs. One difference between this option and the previous one is found in the stitching. This model does not have box stitching. It does have a sturdy solid wood frame, holds up to 250 pounds and is ready to assemble. Another difference is in its size. This model’s dimensions are 26.5″ W x 26.5″ D x 35.5″ H making it slightly larger. But the seat height is slightly lower, coming in at 19”. Unlike leather, this upholstery choice is easy to clean with a little soap and water. The mahogany wood construction also provides a very professional look to your reception area. These office guest chairs will help relax the toughest of clients. In purchasing a good waiting room chair, sometimes simplicity says it best. They say ‘less is more’ which means you do not have to overbuy. Simple cloth and wood furniture will still provide the message you want to say to your visitors. This cloth and the solid wood chair has a unique locking system that allows for easy assembly. It also has generous padding and ergonomic lumbar support. The seat is 19 inches from the floor. While the dimensions (23.5 x 22.3 x 9 inches) are a little smaller they still provide comfort. Good waiting room chairs do not stand out. They blend in to tastefully occupy the room. Their job is to provide comfort not be the center of attention. 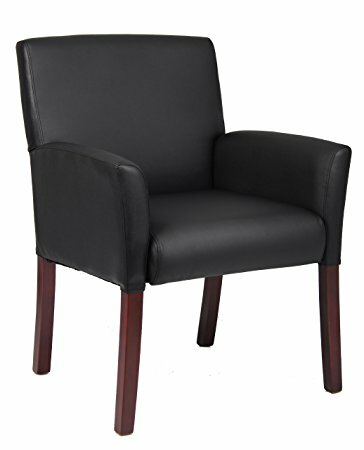 Another simple, professional looking waiting room chair that will spruce up any office waiting room. This contemporary design combined with box stitching, contoured and waterfall seats provide great ergonomic support for your patients. Its strong metal frame is 24 x 25 x 36 inches in size. The seat is approx. 18” from the floor and can hold over 250 pounds. What else can be said about these office guest chairs. They are comfortable, well designed, and easy to assemble. They will add a touch of class to any waiting room. Your waiting room does not have to look like every other waiting room in the city. You can go a little out of the box and purchase this selection. The circular fabric design sits on a sturdy wood frame. This chair will easily combine with sofas, tables and other office furniture to provide a great look. The chair’s dimensions come in at 39.4 x 24.6 x 9.1 inches with the seat approx. 17.5”off the floor. But if you do not want to think outside the box, then this chair will come in boring leather also. A great choice for an office guest chair. We hope this list helps make your search for a great waiting room chair easier and more productive. Just don’t take our word for it. Check these selections out for yourself. Pick the ones you want. Remember you are the one that have to live with them.